Gabriola locations among Heritage BC’s newly designated Japanese-Canadian historic sites. On April 01, 2017, BC Minister for Multiculturalism Teresa Wat announced a list of 56 historic sites with significance to Canadians of Japanese descent. They include two locations in Silva Bay – the Sunrise Sawmill and Koyama’s Fishcamp. The 56 sites were selected from more than 176 province-wide places nominated last year as part of Heritage BC’s Japanese-Canadian Historic Places Project. The background research on Gabriola’s sites is detailed below. Japanese began immigrating to BC in significant numbers at the end of the 19th century. Most settled in Vancouver and Steveston where they worked in the fishing industry or operated small businesses. But they also lived in smaller Japanese communities on Vancouver Island and the Gulf Islands, including Silva Bay on the Southeast shore of Gabriola Island. As far as we are aware, Japanese lived on Gabriola and adjoining Mudge Island from before 1914 until 1942. The impact of Japanese settlers and businesses on Gabriola Island’s social and economic development in the early 20th century was significant and remains today in the form of successor businesses. The earliest record of Japanese persons living on Gabriola Island is found in the 1911 Census of Canada which lists eight Japanese residents on South Gabriola: K. Manakora age 34, K. Shimada age 30, and T. Haseguwa age 21, with occupations given as loggers. The dates of their arrival in Canada are recorded as between 1900 and 1908, and their religious affiliation is given as Buddhist. The handwritten census entries may be misspellings of common Nikkei family names such as Hasegawa instead of Haseguwa, Tsuji instead of Tsumi, and Tanaka instead of Hayanaka. An early Gabriola settler remembered the Japanese as arriving to before 1914 and living in Silva Bay, and on nearby Valdes Island, where they worked as fishers. The eight Japanese residents listed in the 1911 Census do not re-appear in subsequent records, nor are they listed in the 1921 Census. We do not know how long they continued to live on Gabriola after 1911, or where they went after leaving the island. Yoshimatsu Shinde emigrated from the village of Mio-mura in Wakayama Prefecture to Steveston, BC sometime in the late 19th century. According to Japanese historian Hisakazu Nishihama, the first Mio immigrant arrived in Steveston in 1888. Over the next two decades so many others followed that Mio immigrants made up the majority of Steveston’s Japanese-Canadian fishing community. As late as 1940, over 2,000 immigrants from Mio and their descendants still lived in the Steveston area. In Steveston, Shinde married, had two sons, Kichitaro and Yoshiharu, and fished until 1912 when he opened a grocery and general store. The successful business was destroyed in the Great Steveston Fire of 1918. 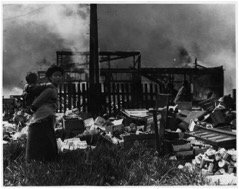 Steveston’s Japanese community after the Great Fire of 1918. Photo: Steveston Archives and Museum. Log booms float on Silva Bay in front of the Sunrise sawmill in early 1920s. Photo: Gabriola Museum Archives. Sunrise Lumber Co., South Gabriola, BC, established in 1919. Y Shinde President & Manager. Manufacturers of Fir Cedar Spruce Hemlock; Finish Lumber, Dimensions (2X4s), Ties, Boxes. Daily production capacity 15,000 board feet. A capacity of 15,000 board feet indicates a smaller mill, as large industrial mills of the time produced about 200,000 board feet a day. While fishing the waters of the Gulf of Georgia, Shinde had visited many of the Gulf Islands and had apparently stopped at Silva Bay where he recognized the advantages of the bay’s sheltered waters, fine stands of timber, and proximity to Nanaimo and Vancouver markets. After fire destroyed his business, Shinde together with his younger brother Matsunosuke Shinde, Fujiichi Matsunaga and and Sentaro Namidome, raised $30,000 ( a considerable sum at the time) and formed the Sunrise Sawmill Company. 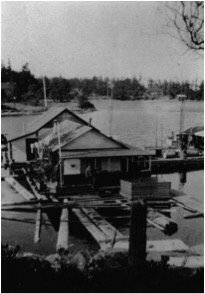 Shinde then leased land on the northwest corner of Silva Bay from Gabriola settler John Silva and erected a sawmill and dwellings for his family and mill workers. Both of Shinde’s sons worked at the mill from time to time. And it is believed that Shinde named the mill “sunrise” for the hinomaru – Japan’s rising sun flag. 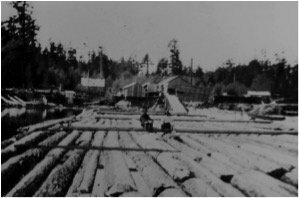 During its years of operation, Shinde’s Sunrise sawmill would have been a significant employer of local labour on Gabriola which only had a population of 260 in 1921. The mill would also have had a wider economic impact as a buyer of locally cut logs and supplier of finished lumber for both local use and export. The Sunrise Lumber mill was destroyed by fire in 1925, after which Shinde and his family returned to Steveston. At that time Yoshimatsu Shinde’s younger son, 19-year-old Canadian born Yoshiharu, was attending business school in Osaka. Presumably after the destruction of the mill there was no longer money to keep him in school, and the young Yoshiharu returned to Steveston where he and his father went back to fishing until 1942 when their boats were seized by the Canadian government and they were removed to internment camps. Today (2016) few traces of the Sunrise sawmill are left in Silva Bay. The site of the mill buildings and booming grounds have been altered by a century of shoreline development. We have few records on the fate of Yoshimatsu Shinde. We do know that both his sons died in 1986, Yoshiharu in Nanaimo, and Kitchitaru in Grand Forks, BC. E. Imede, age 50, arrival in Canada 1900, occupation “boarder,” religion Buddhist. Yoshiharu Shinde, shortly before his death in Nanaimo in 1986. Photo: Gabriola Museum Archives. 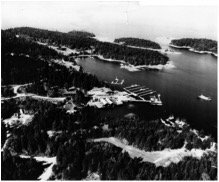 The Census also lists five members of the Harada family as resident on Mudge Island, the small island immediately west of Gabriola. Takashi, Harada, age 3, nationality Canadian. 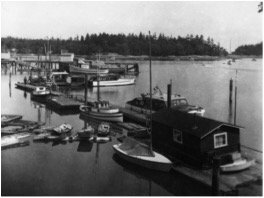 The Gabriola Directory for 1934 lists Kanshiro Koyama as operating a general store and fish-buying wharf on the southwest shore of Silva Bay. Long time Gabriolans recall that Koyama ran the operation with his brother and their families, though we have no records of individual names or family make-up. Another brother, Frank Koyama, ran a seafood company at Brechin Point in Nanaimo that supplied local restaurants. Koyama’s Silva Bay fish camp, including the store and living quarters, was on floats. The floating dwelling was 16 by 24 ft, and constructed of dark shiplap, with a cedar shingle roof and a heavy wall paper interior. It was a plain living space, furnished with the bare essentials – beds, stove, table and chairs, storage shelves – without running water or plumbing. The store was a separate building, 20 by 24 ft. The inventory included a bit of everything: canned goods, tobacco, soft drinks, candy, some bakery items, household cleaners, a few bits and pieces of hardware, lamp mantles, wicks, candles, kerosene, naphtha, motor oils … the necessities. A pot-bellied wood stove heated the store in chilly weather. Koyama’s floating fihcamp showing store in foreground, dwelling behind. Photo: Gabriola Museum Archives. On the steep bank above the camp was a 5000-gallon gas tank and a power generator in an 8 by 10 ft generator shed. The Koyamas dug a 12 ft deep well approximately 100 ft from the water’s edge, and lined it with granite boulders.The shallow well was operated by a hand pump and supplied plenty of water in winter, but dried during the summer. The Koyama fishcamp in 1940’s after purchase by Page brothers. The docks and boathouse in the lower left are the original Japanese structures. Photo: Gabriola Museum Archives. In 1942, the Koyamas were among the 22,000 persons of Japanese origin, half of them Canadian citizens, who were forcibly removed from their homes and businesses and interned in prison camps away from the Pacific Coast. The Koyamas’ Silva Bay property was purchased in 1943 by the Page brothers who continued to operate the store and fish buying camp. Today little remains of the original floats and structures built by the Koyamas, but the business is thriving as Pages marina and resort in the same location and basic outline as when first developed by the Koyamas in the 1930s. CanWest News Service, A piece of Canadiana in rural Japan, April 30, 2009. Fukawa, Masako, Nikkei Fishermen of the BC Coast, Harbour Publishing, 2007. ———————, Spirit of the Nikkei Fleet, Harbour Publishing, 2009. Imredy, Peggy Lewis (ed), Gabriola Island, paper given at Gabriola Three Schools Reunion, Silva Bay Resort, Gabriola Island, Aug 04, 1984. Lewis -Harrison, The People of Gabriola, Gabriola Island, 1982. Nikka Jiho Sha, Kanada Zairyo Doho Soran: Biography of Sawmill Company President -Yoshimatsu Shinde, Edited by Yoshio Matsue, 1920. Reeve, Phyllis, “Japanese-Canadians in Silva Bay, 1918-42,” in SHALE No. 25, Mar 2011, (Journal of the Gabriola Historical and Museum Society) ISSN 1492-6946.